Take this pick made from deer horn that you found in the woods where she liked to walk. Leave the village where your brothers silently split thin branches. New wood, green wood, does not burn well. Walk onto the moors which are bathed in sunlight, sliding through the clouds, patterning the land bright and happy as cheerful woven cloth. Go to the outcrop, where she would sit, and the wind blowing her hair from her face. The wind snatching her laughter. The wind blows cold on the moors. Think that you will never have the strength to rise. Take this horn pick and into the stone make the carving. The cup, the depression, encircled by two rings. Two rings for each of the ten years of her life. Look at the small symbol. 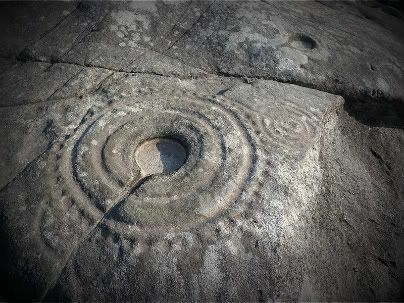 Simple, unlike the carvings on the boulders of the barrow, interlaced connecting of carved rings, and spiral, ladders, linking all to all. Now the ashes of her bones are mixed with the dead. Think that she is free. This carving. The cup and the two rings. So simple, like her life. Run your fingers gently over the stone. Remove the flecks of dust. Think that such a small carving might be washed away by wind and rain, but that it will endure for a good few years. Think that you can come here and remember. On the prehistoric cup and ring carving etched into a Yorkshire stone, five thousand years ago. The meaning of such petroglyphs has been lost. Image adapted from Laxe das Rodas by Froaringus. "So simple, like her life" -- and yet so profound.